Amber Jamison drives to the hoop. The junior sat out Northwestern’s opening-night win over Chicago State, but may return against Oakland. 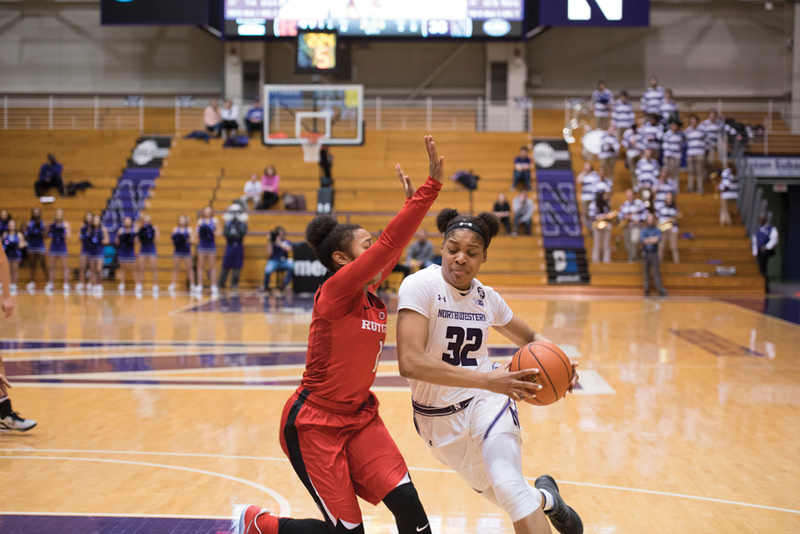 Jordan Hamilton knew she would have to learn to “take a hit” in her first collegiate game, but handled the new environment calmly Friday, leading Northwestern with seven assists. The freshman guard said playing in her debut game felt a little jarring even though the Wildcats routed Chicago State, winning 63-36. When NU (1-0) plays Oakland (0-1) on Thursday in its first home game of the season, Hamilton said everything will feel more familiar. Hamilton and fellow freshman guard Lindsey Pulliam impressed in the season opener, the first time the Cats have started two freshmen from the outset since Nia Coffey, Christen Inman and Ashley Deary in 2013. Pulliam scored 18 points against the Cougars, the most by any NU freshman in a debut since Coffey put up 19 in 2013. Junior forward Pallas Kunaiyi-Akpanah said seeing the freshmen succeed gives her confidence about the team’s potential heading forward. As NU moves into one of the busiest stretches of its season — four games in five days next week — coach Joe McKeown said he hopes the team continues to develop its identity. He described this as effective post play, strong perimeter shooting and athleticism at every position. The Cats won Friday night without junior guard Amber Jamison, who averaged 4.9 points per game last season and is one of the team’s leading returning scorers. Her potential return against Oakland may force Hamilton or Pulliam out of the starting lineup. Jamison could be valuable against the Golden Grizzlies, experienced opponents McKeown said will challenge NU with their physicality and scoring talent. Even if Hamilton and Pulliam don’t start together moving forward, McKeown said he is excited to see them transition into a new environment.